Sunday, December 30 is the final day to view Independent Vision: Modern and Contemporary Art from the Martin Muller Collection at the Arkansas Arts Center. 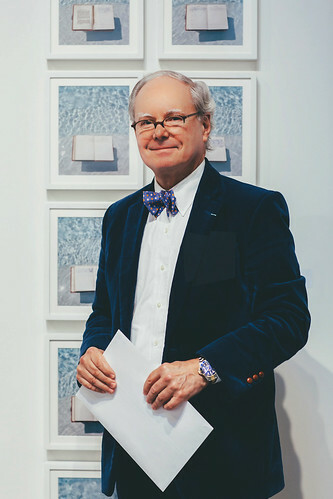 San Francisco-based gallerist and collector Martin Muller curated the exhibition from his personal collection as a tribute to Little Rock – the city where he spent his formative early years in America. During those years, Muller discovered an affinity for post-war American painting in the quiet library of the Arkansas Arts Center. It was the beginning of a lifelong, relentless pursuit of new artistic treasures. “This was the beginning of a rich, colorful, challenging and rewarding journey, started in Little Rock, where I made many lifelong friends,” Muller said. Independent Vision: Modern and Contemporary Art from the Martin Muller Collection features nearly 90 works from Muller’s personal collection representing his journey through contemporary art. The works in the exhibition represent a range of artistic expression, from American photographers Diane Arbus and Robert Mapplethorpe, modernist masters Pablo Picasso and Henri Matisse, pioneers of the Russian avant-garde Kazimir Malevich, Alexander Bogomazov, and El Lissitzky and pop artists Andy Warhol, Mel Ramos and Edward Ruscha. The show also includes a diverse array of contemporary works by artists such as Joel Besmar, Damian Elwes and Jean-Charles Blais. Independent Vision draws from Muller’s personal collection – and represents 77 artists he has championed throughout his career. Together, these works form a picture of Muller the collector, on a life-long journey for enlightenment through art and literature. Born in Switzerland, Muller moved to Little Rock in 1975 to take a job with a Swiss-American company based in Little Rock. Muller was an avid student of 19th and 20th century Russian literature and art – but developed a fascination with post-war American painting – Abstract Expressionism, Pop Art and Minimalism. While living in Little Rock, he pursued his studies in the Elizabeth P. Taylor library of the Arkansas Arts Center. In 1977, having decided to pursue his passion for art professionally, Muller moved west and opened Modernism, Inc. in San Francisco’s warehouse district South of Market. Founded in 1979, Modernism has since presented more than 450 exhibitions, both historical and contemporary, in media ranging from painting to photography, sculpture to performance, by an international roster of artists. Throughout its 39 years, Muller has aspired to keep the gallery’s challenging, museum quality program at the forefront of the art world, with exhibitions encompassing Dada, Cubism, Surrealism, Vorticism and German Expressionism. Muller was also an early promoter and champion of the artists of the Russian Avant-Garde (1910–1930) in the United States. The gallery has held a long list of exhibition “firsts” – in 1980, Modernism held the first exhibition of the Russian Avant-Garde in a West Coast gallery, the first Andy Warhol show in San Francisco in 1982, and in 2003, the first Le Corbusier gallery show in the United States. This entry was posted in Government, Museum, Visual Art and tagged Andy Warhol, Arkansas Arts Center, Damian Elwes, Diane Arbus, Edward Ruscha, Henri Matisse, Jean-Charles Blais, Joel Besmar, Kazimir Malevich, Martin Muller, Mel Ramos, Pablo Picasso, Robert Mapplethrope by Scott. Bookmark the permalink.